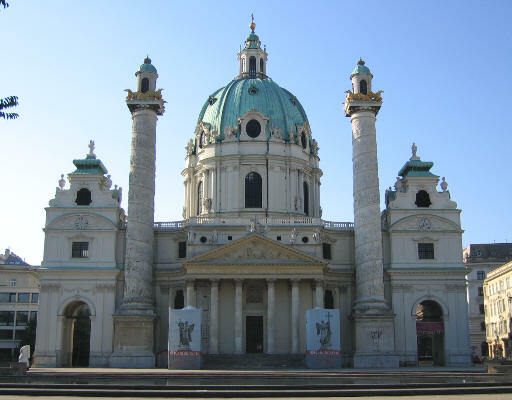 The intensity of cultural, religious and political links between Vienna and Rome is most evident in Karlskirche an imposing church commissioned by Emperor Charles VI to Johann Bernhard Fischer von Erlach: the initial projects were submitted to the emperor in 1715 and it was completed in 1739, just one year before his death. So in a sense it could well be regarded as the emperor's church. It was dedicated to Saint Charles Borromeo and this decision was not without political and religious implications: Cardinal Carlo Borromeo (1538-84), nephew of Pope Pius IV, had a great role in the reformation of the structure of the Catholic Church: he redesigned and clarified the roles of parishes, bishoprics and departments of the Roman Curia. The choice in a sense was very partisan; there were still significant pockets of Lutherans in several provinces of the empire, especially in Hungary. A dedication of the church to a martyr, or an apostle or to a great doctor of the medieval church would have been more acceptable to these subjects, but the emperor wanted to make evident the strong link between his vision of the empire and the Catholic Church. Another reason lay in the very recent acquisition of Milan as a consequence of the 1713 Peace of Utrecht at the end of the Spanish Succession War: the emperor never entirely withdrew his claims to the Spanish throne, but the compensation he received gave him a great influence on Italian matters: Saint Charles Borromeo had been archbishop of Milan and the Borromeo were still a very important family, so the emperor's choice helped in gaining the support of the new Italian subjects. Saint Charles Borromeo was canonized for his activity during a pestilence which had hit Milan. Vienna was just getting over a similar scourge, so the dedication was more than justified also from a local point of view. In addition the saint and the emperor had the same name. The image used as a background for this page shows the motto (Humilitas) of Saint Charles Borromeo in the gardens of the family palace at Isola Bella. 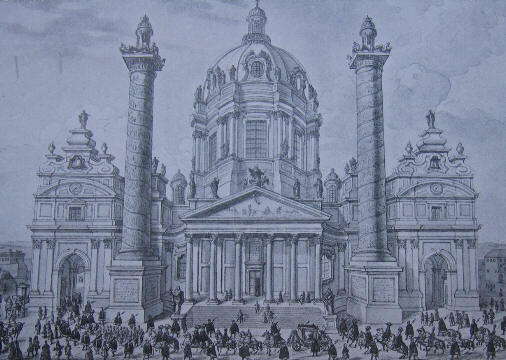 The political objectives behind the erection of Karlskirche were not limited to its dedication to Saint Charles Borromeo: the design of the church was meant to enhance the role of Vienna as a new Rome, the capital of a great empire and at giving true significance to the title Charles VI was most proud of: Imperator Romanus (or Romanorum). While the majesty of the dome is a clear reminder of St. Peter's, the portico and the two spiral columns are tributes to the monuments of Ancient Rome: the Pantheon and the columns of Trajan and of Marcus Aurelius. The dome has an elliptical shape so that in its frontal view one is struck by its vertical thrust; by walking around the church one progressively sees a horizontal expansion and eventually the dome becomes more similar to its Roman cousins Fisher von Erlach knew so well. 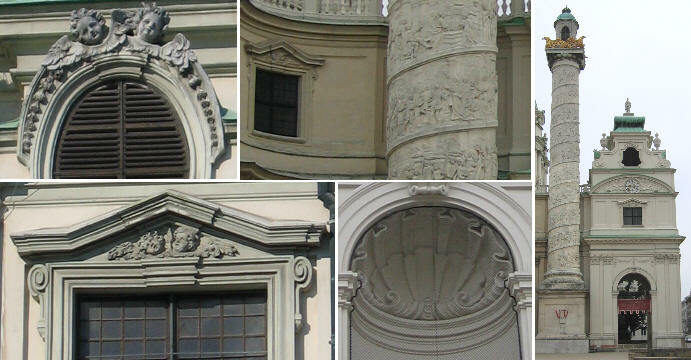 Many details of Karlskirche lead to works by Borromini (the angel heads, the double shells) and Bernini (the impression that the church is embracing the viewer). Bernini suggested to Pope Alexander VII to relocate Trajan's column in Piazza Colonna (where he had just completed the pope's family palace) next to the other one. In 1694 Carlo Fontana developed a project for relocating the column in nearby Piazza di Montecitorio and then merging the two squares in one; so the idea of placing the two columns in the same location had been extensively debated in Rome. Fischer von Erlach built on it, as if to show that Vienna could achieve what Rome had not been able to. 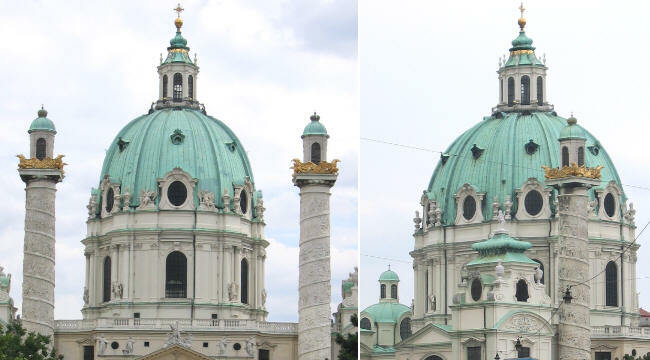 Karlskirche, which is located without the walls, was built at the assumed end of a Via Triumphalis which from the Hofburg palace should have linked the old city with the new one: so it was designed to be the focal point of a large alley longer than a mile and the two tall columns were instrumental to achieving this objective. Via Triumphalis was never opened and we cannot see the church in its entirety from a long distance as planned by Fischer von Erlach. The interior of the church is very bright with a decoration of white stucco and gold; Fischer von Erlach, following the example set by Bernini in S. Pietro, placed a circle of angels and sun rays around a source of light behind the main altar: another Roman quotation can be seen in the ten angels holding elements of the Passion which are placed (8) around the drum or (2) on the steps leading to the church. The elliptical dome was entirely frescoed by Johann Michael Rottmayr, while the church was being completed: he preferred to follow the composed ceiling of Palazzo Barberini by Pietro da Cortona, rather than the more frantic ceilings by il Baciccio: this is particularly evident in some joyous details. Rottmayr had to follow some religious Catholic guidelines which lead him to portray an angel setting fire to the books written by Martin Luther. Sometimes XVIIIth century art shows a lack of strength, but undoubtedly its elegance compensates for it.